The ride is scheduled for Saturday, December 16, 2006. It might rain that day, but that's what happens sometimes in the winter. Don't park in Ken's driveway or that of his neighbors. It's actually best to park a couple hundred yards away on Hibiscus just north of Olga at a school. There is quite limited space on the street, so pretty much everyone will need to park at the school. We will be using Ken's driveway to load the support vehicles. This is several miles farther south than the start used through 2001 for those coming from the North. Enter the park and look for Lorna who will be handling the sign in. She should arrive there about 7:15 A.M., will be driving a grey Honda minivan and will have a six-year-old with her. She will set up a couple folding tables in a hopefully sunny area of the parking lot. There is plenty of parking, picnic tables, and relatively clean bathrooms. We will attempt to get our hands on an awning or two so that we have shade or shelter if needed. For insurance reasons, we can't require payment for the ride as it's presently run. This doesn't mean that the event doesn't cost money to put on. We'd be more than happy to have people make a small donation to help defray the cost of the event. Based on previous year's costs, suggested values might be $10 for century riders and $20 for double century riders. We've made some changes to the route so if you've done the ride before, don't assume that you know the route. A few years ago we added a change that gets everyone off of Hwy 25 a few miles earlier, but adds a couple miles to the route. 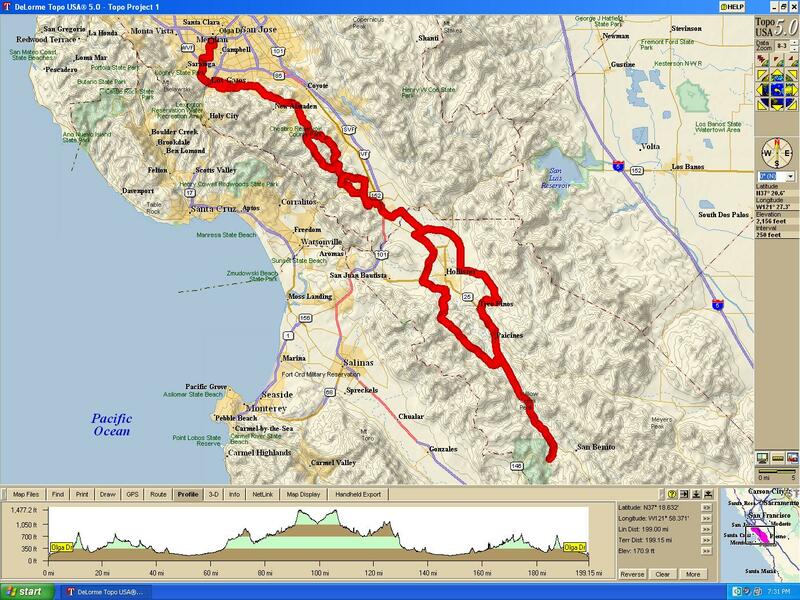 We'll check on the road the week prior to this ride and decide the route then. I have attached a copy of the route to the bottom of this. The double will have a mass start. For the first 3 or 4 miles, please stay together and don't run into anyone in the dark. We will make several turns so if you aren't sure where to go, stay at the back and follow those who know the route. Once we get on Quito, everyone is on their own and can go whatever speed they want. i.e. feel free to drop me. The first 10 miles of the route out in the morning is the reverse of the route home in the afternoon. 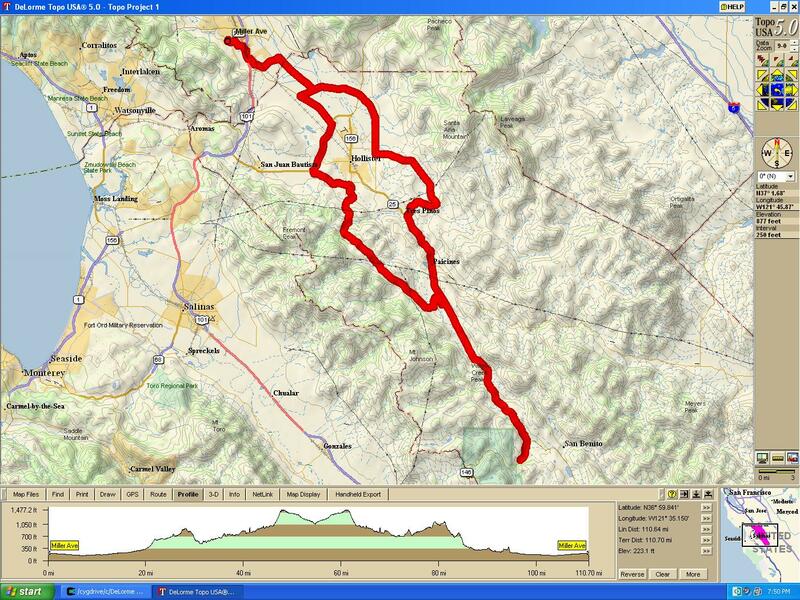 The route heads over Kennedy to the Almaden area, and out past the reservoirs to Gilroy. We bypass downtown Gilroy. The "century" is about 111 miles but the double measures some where around 199 miles - depending on who's bike computer you want to believe. Century riders should not need lights. If they need them they will be riding much too slow and will need to be sagged in so that the support people can get back north. On that day civil twilight will be 6:46 A.M. in the morning and 5:21 P.M. in the evening. The actual sunrise and sunset will be 7:15 A.M. and 4:51 P.M. respectively. The moon will be a waning crescent with 14% of the visible disk illumniated, so it won't be much help. You will be able to drop your lights off at the Gilroy rest stop and pick them up when you return, so there is no need to haul the things the whole way. Unless you want to. Compared to a typical century, this ride is very lightly supported. The rest stops are about 50 miles apart. There are some very long stretches without stores or gas stations. We will probably have one or two SAG vehicles on the route, but with riders spread out over 50 miles by the finish, if you need a SAG vehicle, it can take quite a while for one to show up, so you need to be pretty self sufficient. Riders should come prepared to deal with rain and cold. We will not have anywhere near enough capacity to SAG everyone to the finish or probably even to the next rest stop, so you need to be ready to ride 50 or more miles while wet and/or cold. You need to have your bike in good mechanical order. The only rest stop that will have much SAG capacity is on the way back at Gilroy. This is the finish point for the century riders and they may be able to help carry DNFing double riders back to San Jose. We will have full route sheets for the entire ride. Please take one and stay on the route. If you get off the route, we will have trouble finding you. There will be no markings on the road. We will take down everyone's name when they start and then will time them into and out of every rest stop. If you are going to stop, or turnaround at some point, make very sure that this is reported to the people running the rest stops. Make sure that they do get your name when you get to rest stops and when you finish. We don't want to lose anyone and we don't want to be looking for anyone who has gone off to do their own thing. We have a potluck dinner at Ken's place after the ride. I normally provide beer, soft drinks, and wine. We will have pasta also. The double riders should bring their dishes with them at the start and we'll find some refrigerator space for everything. We'll also provide showers to the double riders. But please bring a towel. Please re-confirm your attendance, preferably by e-mail, on December 11 or 12 to me at craig.robertson@sbcglobal.net. You may have told me already, but reconfirm so that I'm sure who to expect. Tell me which ride you are planning to do. I will be shopping for rest stop food on Wednesday or Thursday (and beer also) and need to have a reasonable head count by then. My wife, Lorna Toyota, will be running the Gilroy rest stop. She will have a six-year-old boy, James, with her, so you may have to wait or take care of things yourself while certain details are dealt with. The whining, crying, and other noises will be free. Those who have done the ride before know what to expect.